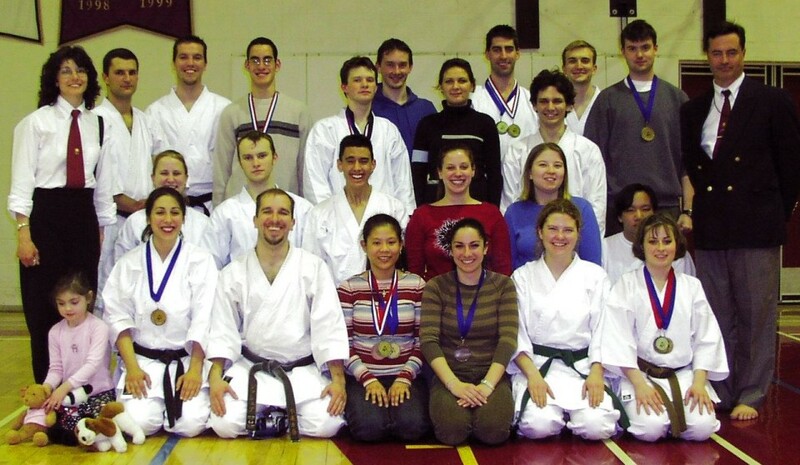 UConn team to the Montreal Tournament, March 2003. Front row: Mega Jacobs, Lia Burnham (3rd womens kata), Josh Wilbur, Abby Barrera (1st 9th kyu kata & kumite), Nicole Dinicola (2nd white belt kumite), Alison Flannery, Karla Kanode (2nd brown belt women kata, 3rd kumite). Second Row: Melissa Jacobs, Mike Jacobs (3rd mens kumite), Joe Vincente (1st mens kata) , Melissa Gernat (3rd 9th kyu kumite), Chrissy Phalstaff, Lam Wong. Third Row: Matte Thomas, Bako Bakoledis (3rd mens kata, 4th kumite), Mike Burnham, Mark Zipadelli (3rd 9th kyu kata), Ryan Jacobs (1st mens kumite), Rim Baltaduonis, Edit Kastal, Dan Napier (2nd brown belt men kumite) , Matt Delude (1st brown belt men kata), Mike Nannini, Dan Burfoot (3rd white belt kumite), Bob Jacobs. 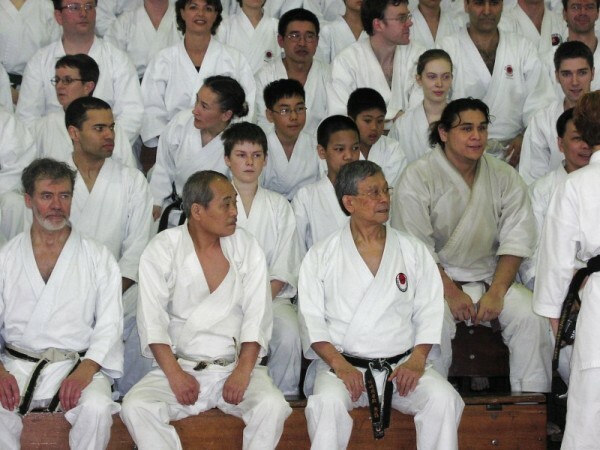 Francois Gellinas, Sensei Mori and Sensei Okazaki wait for the group shot to be taken. Dan Napier, Alison Flannery and Mega pass the time on the sidelines.